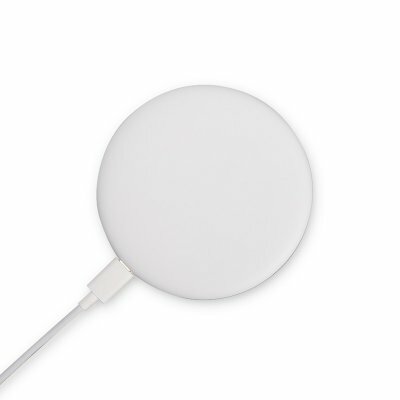 Successfully Added Xiaomi Wireless Charger – Qi Standard Compatible, 7.5W Charging, USB-C, Compact, Lightweight, Modern Design to your Shopping Cart. Charge your phone anywhere you go with this compact wireless charger from Xiaomi. The Xiaomi wireless charger features a compact and smooth round design. Its lightweight body makes it easy to carry along no matter where you go. With its spotless white design, the wireless charger from Xiaomi surely is a feast to look at. Whether you use it at home or on the go, this Qi charger will charge your phone in the blink of an eye. The wireless charger is compatible with Qi charging standard phones. It is safe to use and treats you to ultra-fast 7.5W charging. Thanks to this, you never have to worry about running out of juice again. Simply charge your charger via the USB-C port and you’re ready to take it along anywhere you go. When you want to charge your phone, all you have to do is switch on this stunning wireless Xiaomi charger, place your phone on top, and your gizmo will take care of the rest. No matter where you are, from now on you’ll never have to experience an empty cell phone battery again. This wireless Qi charger comes with a 12 months warranty, brought to you by the leader in electronic devices as well as wholesale phone accessories..